Midges belong to the insect order Diptera, the true flies. Diptera, from the Greek, means two (di-) wings (-ptera); all Dipterans have only one pair of functional wings in contrast to most insects which have four functional wings. The midge is one of the largest, most highly evolved and biologically diverse of the insect orders. Stephen R. Moulton II, Aquatic Entomologist writes that there are between 25 – 30,000 species identified and unidentified, so attempting to identify them individually is not the lot of the humble trout fisherman. However, as they are so small and similar identifying the color and size of the fly to match the insect the trout is feeding on is all that really matters. Of the different families of midges, the most important to trout and trout fishermen are those of the Family Chironomidae or the non-biting midge. 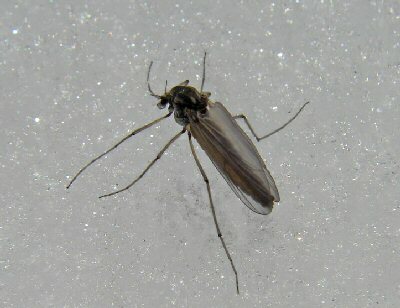 Although the adult midges are terrestrial, in a number of families, including Chironomidae, the immature stages are aquatic. Hence the relevance to trout fishing. The life cycle of the midge is egg, larva, pupa and adult. The latter 3 stages are all important to the trout fisherman. The larva is slender, commonly cylindrical and slightly curved. The larva lives in the bottom of the river and as it matures towards the pupal stage it begins to swim up in the water column to emerge. Adults can be mistaken for mosquitoes. When the midge larva first emerges from the mud it is red. As it becomes oxygenated and begins to rise it will assume its darker color which might be gray, black, dark olive depending on the sub-group to which it belongs. But for our purposes we recommend fishing the red larva deep and then the darker color a little higher in the water column. The midge larva can emerge in massive densities in the river at various time hence their importance as a trout food. Similarly as the larva evolves into the pupal stage it will be the color of the group it belongs to ranging from a darker red through to black. We have over 200 midge patterns in the shop in an attempt to provide a complete range of options for the fisherman. Finally it will emerge and hatch as an adult fly. Chironomid adults only have a single pair of clear wings unlike other common aquatic insect adults that have two pairs of wings. 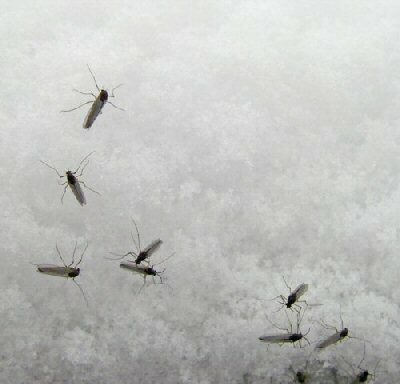 The period of the midge life cycle varies much through the species. Here we have species with very rapid cycles resulting in them producing many generations in a year. In addition some of these species emerge year round, especially during the winter months when there are several consecutive days of warm weather which serve to stimulate larval growth and trigger an emergence. Hence the importance of a range of midge patterns for year round fishing. The trout will feed on them at all of these stages, however generally most of the feeding will be on the rising larva and pupal stages.